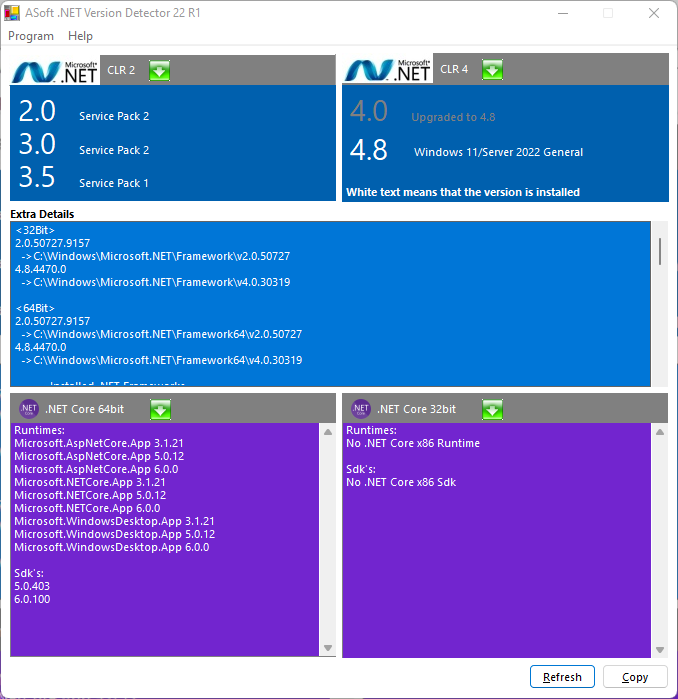 ASoft .NET Version Detector is a lightweight tool that gives information on the different versions of Microsoft .NET that are installed on a machine. edit1: the green is visible now. Last edited by I am Baas on Fri Oct 04, 2013 7:01 pm, edited 5 times in total. Useful for checking on some of the issues raised by John T. in another thread... Excellent. You know I can't resist by saying ..."Ran out of paint?" Nice find by the way. guinness wrote: You know I can't resist by saying ..."Ran out of paint?" Nice find by the way. I use it sparsely... running out of green... will get more in the next few days. How very cryptic. I haven't been testing recently as I've had my developer hat on! But its not stealth as it leaves this reg key? the accountant wrote: But its not stealth as it leaves this reg key? I tested on Windows XP SP3 (without .NET, no idea if this affects the addition of the license key) and selected the close button and I didn't get any registry key. the accountant is correct. I did not get this the first time I tested though. Funny thing is that if you do not accept the license by just hitting the "Close" button you could still use the application. It will still write an empty key to the registry though. Will amend the first post. On the XP machine the OK & Cancel button weren't even visible so that's why I clicked 'Close' (no empty registry key on XP,) I don't know it it's because I used a VM machine smaller than my monitor (so therefore it was 'drawn' out of bounds) but this shouldn't even be a problem. Anyway the application has some fatal flaw(s) e.g. using the close button to bypass the license agreement. I'm in the midst of creating a similar (non .NET) application. Watch this space. Version 14 can now also detect .NET 4.5.1 and an extra remark is added to the UI which indicates up until which .NET Version it supports.